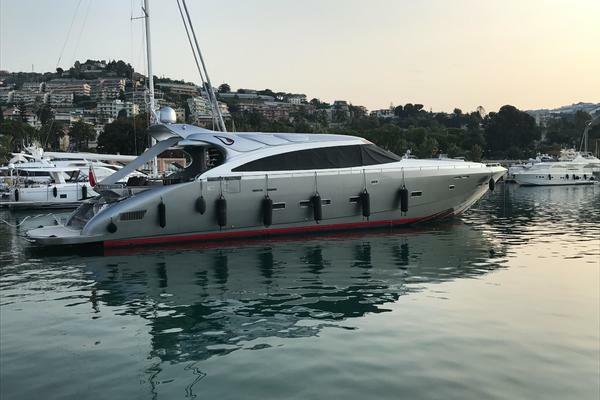 Custom 103' Explorer 2021 | All Ocean Yachts Bc 103 "steel Or Fiberglass"
103' Custom Explorer 2021 All Ocean Yachts Bc 103 "steel Or Fiberglass"
All Ocean Yachts BC 103’ M.P.E (Multi Purpose Explorer)The mission profile for the AOY BC 103 M.P.E was to create a multi purpose Explorer based on the highly innovative design concept of the AOY 90' and AOY 100' cockpit Explorer.The concept of the M.P.E is to meet a number of different niche Explorer missions without major redesigns and in a cost efficient manor by utilizing the same construction platform as the other AOY Explorer, the same outstanding specifications, sea keeping, long range features and flexible interior arrangements. This enables us to bring multi vessel build savings to niche design Explorers.First I would like to explain the BC notation in the name stands for Bob Connell a world class sailor, top surveyor, yacht builder and extraordinary person who I had the great pleasure of knowing. Bob had a great deal of input into not only the AOY Explorers but all the Explorers I have worked with over the past 20 years.A donation from the sale of each of the AOY BC 103' M.P.E models will be made in Bob's name to the US SAILING ORGANIZATION.The niche Explorer missions we have identified and designed for to date are as follows:The R.S.E (Regatta Support Vessel) The mission profile for this vessel is to support Ultra Large Sailing Yachts during the many and ever increasing Regattas that they participate in and it will also provide the samehigh level ofsupport the many fleet and other sail boats in regattas around the world.Description:Lower DeckThe lower deck can have the standard AOY layout with the addition of Pullman berths in the twin guest staterooms or have the option to have the port crew double bed switched to match the starboard upper and lower bunk arrangement.Starting at the bow; the lower deck provides for crew cabins for four crew with ensuite heads. Next aft to port is a large crew mess with sink, fridge, microwave and settee. The settee can be converted to a full size bunk for short term extra crew or dive and fish guides. The settee has storage under it.Next aft to port is the huge full size laundry and dry goods storage area. The laundry has two full size washer and dryers, area for cloths press, large sink and a door to the guest cabins to allow for direct service from the crew areas.This laundry is large enough to not only service the vessels guest but to handle additional laundry from the racing sailboat crew.Going through to the guest areas, aft are two lower guest cabins with Pullman berths and just forward to starboard is a large queen cabin. All cabins haveensuite heads with separate showers.Main deckThe standard main deck layout is the country kitchen layout, which is an optional on the AOY 90 and 100.Starting at the bow there is a large storage area with twin chest freezers, commercial refrigerator and a huge dry goods storage area.The vessel has extensive dry storage and refrigerator and freezer space to provide for the high number guests it is designed to support.Next aft to port is an over size banquette dinning table that can seat up to 12 persons, there is extensive storage under the seating.There is a large TV located behind the banquette seating which can be used for movies or review of sailing events or other corporate use.Next aft to port is a counter dining area with seating for 5 which is open to the galley.To starboard forward is a desk/office area, to aft of that is a full wet bar with drink fridge, wine cooler, ice maker, sink and storage. 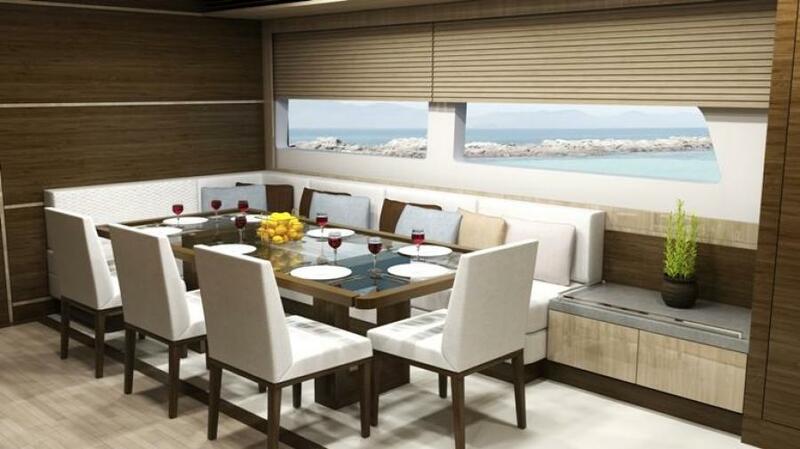 This area can also be used as a service area and side bar for dining.Next aft to starboard is a extendable banquette dining table with seating for up to 10 persons. There is storage under the bench seat.The combination of the two dining seating and counter dining gives you the ability to seat up to 27 people in the dining zone.There is additional seating for 10 on the main deck aft in the bar area for a total of 37 seats on the main deck inside.When flybridge seating is taken into account there is standard seating for 50 people for dining.This does not take into account additional tables that can be set up on the aft deck for large parties.Servicing this huge amount of standard seating is possible because of the large commercial galley located aft and to port of the dinning zone.The galley is outfitted and equipped with top quality commercial equipment. 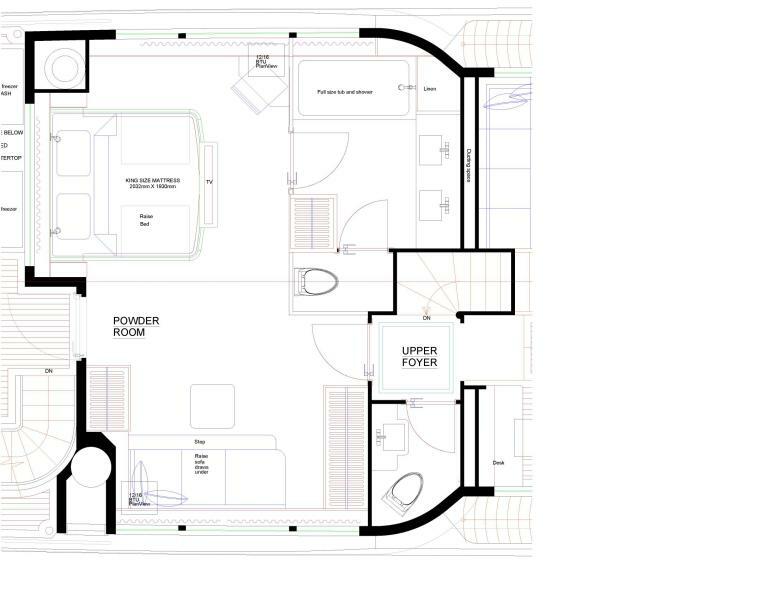 In the chef's area there is a 6 burner cook top, high grade ventilation system, twin convection ovens, microwave, triple sink with disposal, dishwasher andfull size commercial refrigerator for the chef. There is extensive counter space and cabinets.Aft of the chef's zone is the stewardess zone, the stewardess has her own triple sink, trash compactor and a 3 minute dishwasher. There is extensive flatware and china storage with dual doors allowing china to be placed in the cabinets from the galley side and removed from the dinning zone. This is a wonderful feature when serving a large number of guests. There is a second wine cooler and side bar integrated into the china cabinet. Aft of the stewardess area is the 2nd large pantry and then a door directly to the side deck for easy access of crew and supplies. 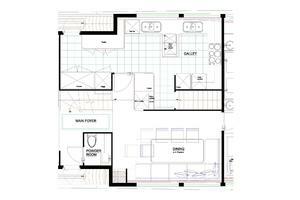 Across from the pantry is a commercial full size refrigerator and a double door freezer.The total number of full size refrigerators in the dinning and galley zone is 3, plus 2 wine coolers, a drink refrigerator and an ice maker. There are a total of two full size chest freezers and one double door freezer.The galley has direct access to the lower crew area and direct access to the side deck.There are over sized windows throughout the dining and galley areas.Next aft from the dinning zone is the main foyer with stairs to the bridge deck and lower deck plus a head and large wet locker.Aft of the Main foyer is the bar, game and TV room. There is a large full servicebar with direct access from the galley. The bar has a sink, drinks fridge, wine cooler and large ice maker. There is a game table that can seat 4 or expand to seat 8 plus additional seating.Aft of the bar zone through an over sized door is the huge SERVICE DECK. This deck is 20 x 22' or 440 sqft of space. There are two over sized 10'x 5' deck hatches to port and starboard to allow extra large sails to be transfer from the sailing vessel to the large sail locker/lazarrete by the 2 ton crane located at the back of the pilothouse deck.Port and starboard bulwarks have removable hand rail sections to allow for easy transfer of sails from the 22' rib chase boats stored on the bow or direct from the sailboat. There is space between the deck hatches to hold either a 10'x8' container or a service trailer while still being able to open either hatch. The crane can off load the trailer or container direct to shore. The engine room can be accessed via a door on the port side of the house aft.Forward on the aft deck by the entrance door is another wet bar with sink, drink fridge and trash compactor.This deck is highly flexible and can be utilized for any purpose imaginable.A large tent awning can be deployed to cover the area either to provide shade to work, repair sails or to set up bands and tables. The awning is supported by the craneThere is a comfortable swim platform aft with direct access to the sail locker/lazarrete via an over sized door and access to the engine room again via an over sized door which can accommodate the removal of any equipment in the engine room.Pilothouse deck:The pilothouse deck can be reachedfour ways, via the stairs off the starboard aft deck, via the stairs forward on the port and starboard side decks or via the internal stairs off the main foyer.The standard pilothouse layout has the captain cabin behind the bridge, which is an option on the other AOY Explorers. The pilot house is large; there is a raised settee in the cornerto starboard aft, center line helm chair, and centerline bench seat.Thecaptain’s desk/communications center is to port. The door to the captain’s cabin is between the centerline bench and the desk. There is a full size navigation console forward with room for an array of equipment for worldwide navigation. To port and starboard are draws and storage. 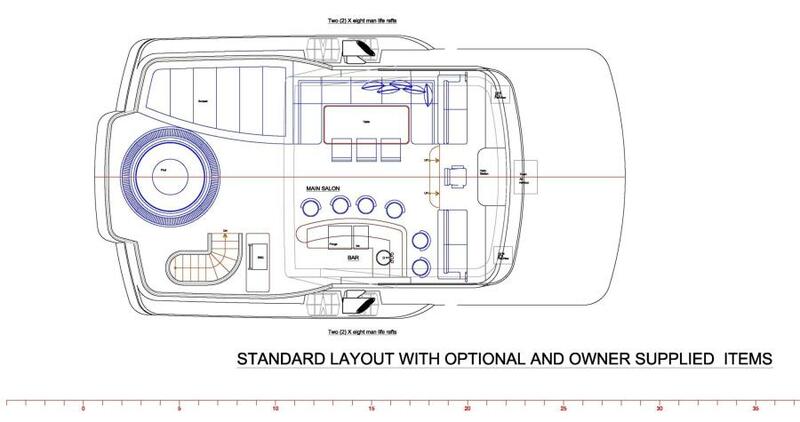 The port size draws will hold full size chart as will the nav counter above it.The captain’s cabin has a full size raised double bed with draws under, hanging locker, with integrated draws and an ensuite head with separate shower.Next aft is the upper foyer which leads to the master stateroom with raised king size bed with storage under. The raise bed allows for maximum enjoyment of the large windows and additional draw space. To starboard is a raised lounge/day bed that is built into the window for relaxing and enjoying the stunning view. There are draws and storage under the lounge. There are 3 full size hanging lockers for a total of 9' of closet space. Centerline forward of the bed between two of the closets is a large chest of draws and a 52' TV.The spacious ensuite head has excellent private window space and large shower.There is space for a total of 11 guests including the day bed.Next aft is the master deck, with room for chairs and a table. There are also two additional chest freezers plus the aft crane.Flybridge deck:Stairs lead from the aft main deck up to the pilothouse deck and then up to the vast flybridge. This is a flybridge you would expect to see on a 130' vessel. As you come up the stairs you will first see the large Jacuzzi, perfect for soaking away the aches of a full day of racing, an extra large sun pad area greets you next with room for several people to relax and take a snooze. 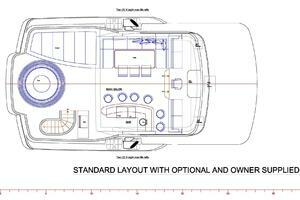 There is storage under the sun pad.Next forward to port, under cover, is an over size seating and dinning area with storage under, to starboard of that is a large full bar with seating for six, drinks fridge, ice maker, sink and storage. Aft of the bar is the BBQ center.Forward up two steps is the raised stadium seating with two 6' plus bench seats to port and starboard and a center helm. Guest can follow the races from this vantage point or the seats are sized to be comfortable day beds to read and relax in the shade.Looking forward from the raised seating you will see the boat deck, capable of carrying 2 x 22' chase boats or a combination of tenders. These large tenders will not only allow you to service the race boats but will keep your guest dry while ferrying them to shore or to water activities.When the tenders are off, this deck becomes another excellent place from which to watch the race action.This is one of several combinations of interior layouts that are available for the AOY BC 103 R.S.EThe D.S.V (Dive/Wreck/Research Support Vessel)Mission profile: to meet the requirements of the people that are dedicated divers and/or researchers and/or wreck hunters who wishto explorer and dive remote locations around the world.Any of the interchangeable layouts will accommodate and support extensive worldwide remote diving.The large lazarrete will accommodate a full dive center including a decompression chamber. 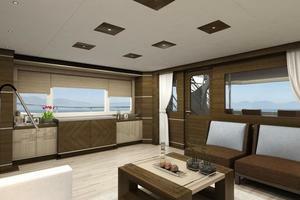 The expansive aft deck is a highly flexible area. The removable rails will allow for easy deployment and retrieval of side sonar, shark cages, floating dive platforms, suction dredges and other equipment. You can carry a huge array of under water toys on deck and/or a 10'x8' container for research or other gear. You also have the option to use this deck to carry a 3rd tender.The 2 standard large tenders can carry divers too hard to reach dive sites or shore to explorer.I would suggest the captains up layout to allow for extra crew to help with dive operations and/or carry guides.The T.C.V (Toy Carrying Vessel) Mission profile; to carry as many and as wide a variety of water and land toys as possible.The highly flexible large aft deck and the huge lazarrete with over size hatches, and large forward boat deck allows the vessel to carry a LOT and a verity of toys. If you want to carry a jeep on deck, no problem, maybe a small fixed keel sailboat, sailing cat, standard or folding, no problem. Need to carry canoes, kayaks, paddle boards, windsurfers, kite boards, hover craft, water slides, Bladefish dive scooter, any type of scooter, motorcycle,again no problem. How about carrying a folding wing air plane? Same answer, not a problem. You have a huge open format to decide what you want to carry, change your mine, not an issue. 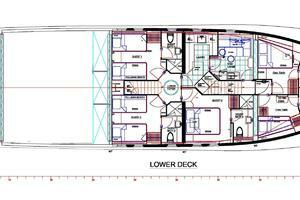 The areas are designed to be completely flexible spaces.What you carry and when you carry it is up to your imagination.Regarding accommodations and crew,it isagain recommended to have the captain's cabin up layout. The more toys you have the more crew you will need to keep them up and to take care of everyone playing on them.The S.S.V (Submarine Support Vessel) Mission profile; carry a submarine to remote locations.We have had a number of clients that are interesting in exploring the world and having a submarine on board. Most of the vessels that can carry a 2 or 3 man submarine are quite large and/or conversions. 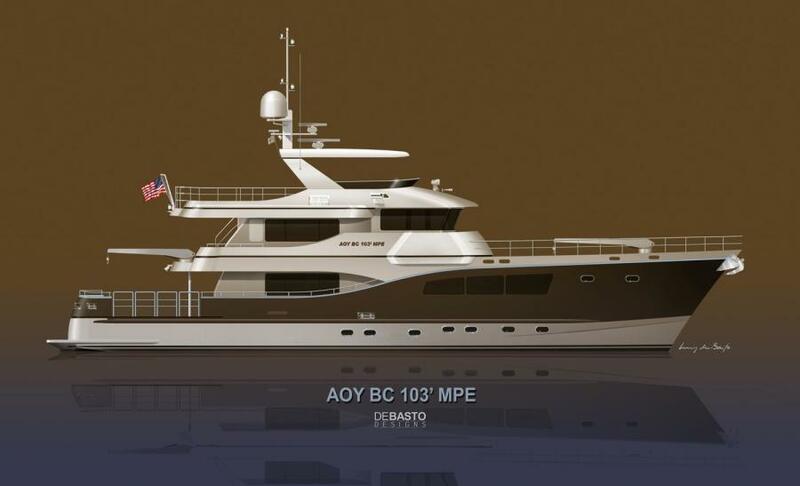 The AOY BC 103 SSV is the most compact size that will accommodate a submarine up to 18,000 pounds.Any of the standard or optional layouts will work on this vessel.All Ocean Yachts has spent a great deal of time speaking with the submarine manufactures and crews that have worked on vessels with submarines and one thing we have noted is that on all of the vessels, deploying and retrieving the submarine is a human intensive procedure. For this reason I have made the standard layout for the S.S.V a captain’s cabin up layout with the option for an additional crew’s cabin in the lazarrete. This will give you up to 7 crew or a combination of crew and submarine pilot or guide.The 18000 pound sub is the max size this vessel can carry and deploy. It requires an aft two point A frame crane system. Smaller subs can use a boom crane.Depending on the intentions of the owner, the vessel can be used for research, with a lab set up in the skylounge area or for film work with a film lab again in the skylounge area. The lazarrete accommodates a full dive center.Please let me know if you can think of another niche explorer need that you would like to accommodate. 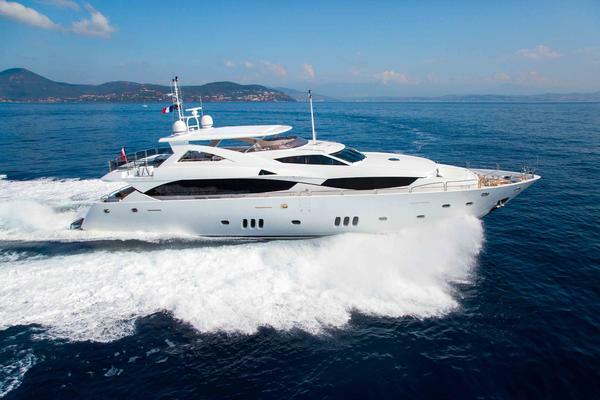 United Yacht Sales New Jersey would love to guide you through a personal showing of this 103' Custom Explorer 2021. 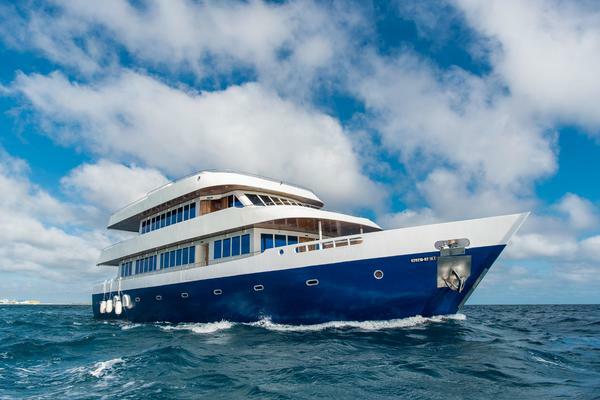 This yacht for sale is located in Unknown Brazil and priced at $9,350,000. For a showing please contact us by filling out the form on this page and we will get back to you shortly! The mission profile for the AOY BC 103 M.P.E was to create a multi purpose Explorer based on the highly innovative design concept of the AOY 90' and AOY 100' cockpit Explorer.The concept of the M.P.E is to meet a number of different niche Explorer missions without major redesigns and in a cost efficient manor by utilizing the same construction platform as the other AOY Explorer, the same outstanding specifications, sea keeping, long range features and flexible interior arrangements. This enables us to bring multi vessel build savings to niche design Explorers.First I would like to explain the BC notation in the name stands for Bob Connell a world class sailor, top surveyor, yacht builder and extraordinary person who I had the great pleasure of knowing. Bob had a great deal of input into not only the AOY Explorers but all the Explorers I have worked with over the past 20 years.A donation from the sale of each of the AOY BC 103' M.P.E models will be made in Bob's name to the US SAILING ORGANIZATION.The niche Explorer missions we have identified and designed for to date are as follows:The R.S.E (Regatta Support Vessel) The mission profile for this vessel is to support Ultra Large Sailing Yachts during the many and ever increasing Regattas that they participate in and it will also provide the samehigh level ofsupport the many fleet and other sail boats in regattas around the world.Description:Lower DeckThe lower deck can have the standard AOY layout with the addition of Pullman berths in the twin guest staterooms or have the option to have the port crew double bed switched to match the starboard upper and lower bunk arrangement.Starting at the bow; the lower deck provides for crew cabins for four crew with ensuite heads. Next aft to port is a large crew mess with sink, fridge, microwave and settee. The settee can be converted to a full size bunk for short term extra crew or dive and fish guides. The settee has storage under it.Next aft to port is the huge full size laundry and dry goods storage area. The laundry has two full size washer and dryers, area for cloths press, large sink and a door to the guest cabins to allow for direct service from the crew areas.This laundry is large enough to not only service the vessels guest but to handle additional laundry from the racing sailboat crew.Going through to the guest areas, aft are two lower guest cabins with Pullman berths and just forward to starboard is a large queen cabin. All cabins have ensuite heads with separate showers.Main deckThe standard main deck layout is the country kitchen layout, which is an optional on the AOY 90 and 100.Starting at the bow there is a large storage area with twin chest freezers, commercial refrigerator and a huge dry goods storage area.The vessel has extensive dry storage and refrigerator and freezer space to provide for the high number guests it is designed to support.Next aft to port is an over size banquette dinning table that can seat up to 12 persons, there is extensive storage under the seating.There is a large TV located behind the banquette seating which can be used for movies or review of sailing events or other corporate use.Next aft to port is a counter dining area with seating for 5 which is open to the galley.To starboard forward is a desk/office area, to aft of that is a full wet bar with drink fridge, wine cooler, ice maker, sink and storage. 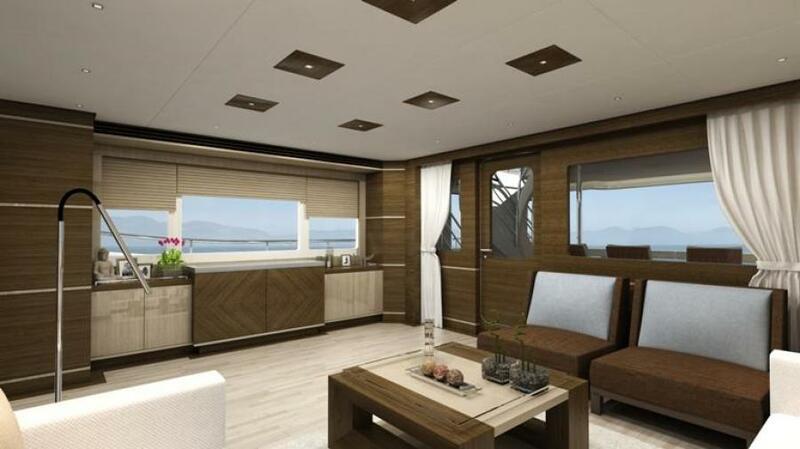 This area can also be used as a service area and side bar for dining.Next aft to starboard is a extendable banquette dining table with seating for up to 10 persons. There is storage under the bench seat.The combination of the two dining seating and counter dining gives you the ability to seat up to 27 people in the dining zone.There is additional seating for 10 on the main deck aft in the bar area for a total of 37 seats on the main deck inside.When flybridge seating is taken into account there is standard seating for 50 people for dining.This does not take into account additional tables that can be set up on the aft deck for large parties.Servicing this huge amount of standard seating is possible because of the large commercial galley located aft and to port of the dinning zone.The galley is outfitted and equipped with top quality commercial equipment. 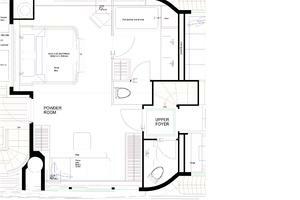 In the chef's area there is a 6 burner cook top, high grade ventilation system, twin convection ovens, microwave, triple sink with disposal, dishwasher and full size commercial refrigerator for the chef. There is extensive counter space and cabinets.Aft of the chef's zone is the stewardess zone, the stewardess has her own triple sink, trash compactor and a 3 minute dishwasher. There is extensive flatware and china storage with dual doors allowing china to be placed in the cabinets from the galley side and removed from the dinning zone. This is a wonderful feature when serving a large number of guests. There is a second wine cooler and side bar integrated into the china cabinet. Aft of the stewardess area is the 2nd large pantry and then a door directly to the side deck for easy access of crew and supplies. Across from the pantry is a commercial full size refrigerator and a double door freezer.The total number of full size refrigerators in the dinning and galley zone is 3, plus 2 wine coolers, a drink refrigerator and an ice maker. There are a total of two full size chest freezers and one double door freezer.The galley has direct access to the lower crew area and direct access to the side deck.There are over sized windows throughout the dining and galley areas.Next aft from the dinning zone is the main foyer with stairs to the bridge deck and lower deck plus a head and large wet locker.Aft of the Main foyer is the bar, game and TV room. 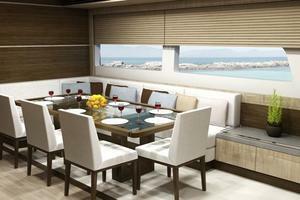 There is a large full service bar with direct access from the galley. The bar has a sink, drinks fridge, wine cooler and large ice maker. There is a game table that can seat 4 or expand to seat 8 plus additional seating.Aft of the bar zone through an over sized door is the huge SERVICE DECK. This deck is 20 x 22' or 440 sqft of space. There are two over sized 10'x 5' deck hatches to port and starboard to allow extra large sails to be transfer from the sailing vessel to the large sail locker/lazarrete by the 2 ton crane located at the back of the pilothouse deck.Port and starboard bulwarks have removable hand rail sections to allow for easy transfer of sails from the 22' rib chase boats stored on the bow or direct from the sailboat. There is space between the deck hatches to hold either a 10'x8' container or a service trailer while still being able to open either hatch. The crane can off load the trailer or container direct to shore. The engine room can be accessed via a door on the port side of the house aft.Forward on the aft deck by the entrance door is another wet bar with sink, drink fridge and trash compactor.This deck is highly flexible and can be utilized for any purpose imaginable.A large tent awning can be deployed to cover the area either to provide shade to work, repair sails or to set up bands and tables. The awning is supported by the craneThere is a comfortable swim platform aft with direct access to the sail locker/lazarrete via an over sized door and access to the engine room again via an over sized door which can accommodate the removal of any equipment in the engine room.Pilothouse deck:The pilothouse deck can be reachedfour ways, via the stairs off the starboard aft deck, via the stairs forward on the port and starboard side decks or via the internal stairs off the main foyer.The standard pilothouse layout has the captain cabin behind the bridge, which is an option on the other AOY Explorers. The pilot house is large; there is a raised settee in the cornerto starboard aft, center line helm chair, and centerline bench seat.Thecaptain’s desk/communications center is to port. The door to the captain’s cabin is between the centerline bench and the desk. There is a full size navigation console forward with room for an array of equipment for worldwide navigation. To port and starboard are draws and storage. 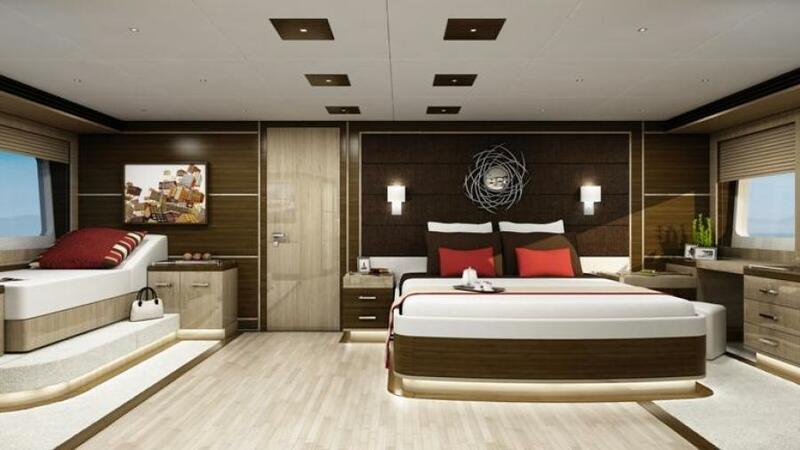 The port size draws will hold full size chart as will the nav counter above it.The captain’s cabin has a full size raised double bed with draws under, hanging locker, with integrated draws and an ensuite head with separate shower.Next aft is the upper foyer which leads to the master stateroom with raised king size bed with storage under. 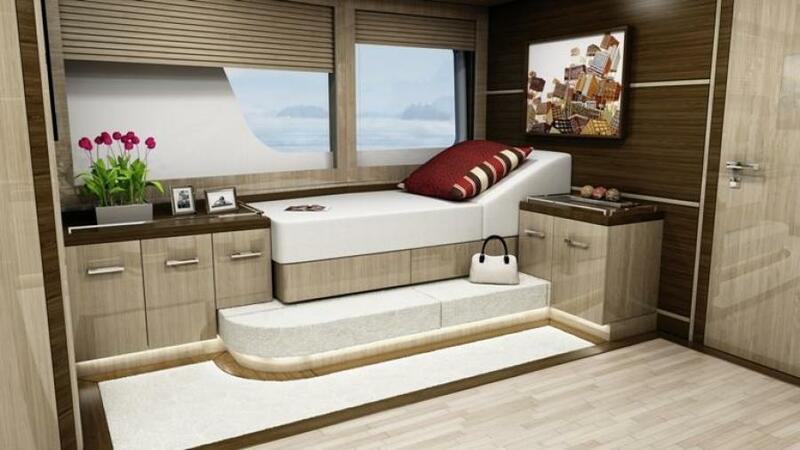 The raise bed allows for maximum enjoyment of the large windows and additional draw space. To starboard is a raised lounge/day bed that is built into the window for relaxing and enjoying the stunning view. There are draws and storage under the lounge. 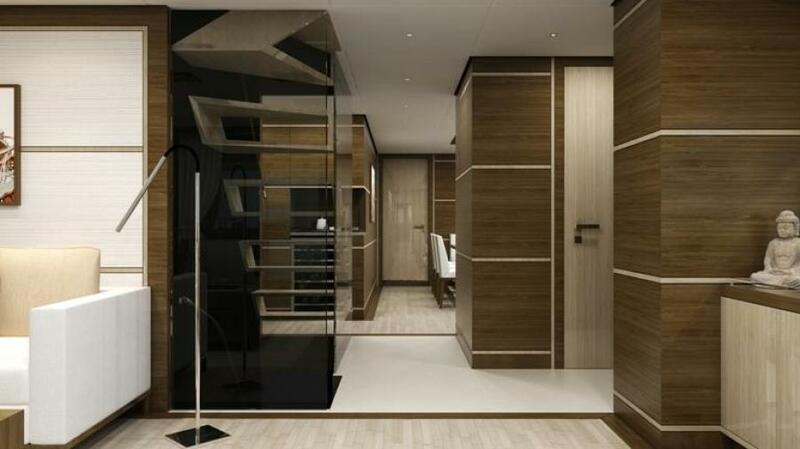 There are 3 full size hanging lockers for a total of 9' of closet space. Centerline forward of the bed between two of the closets is a large chest of draws and a 52' TV.The spacious ensuite head has excellent private window space and large shower.There is space for a total of 11 guests including the day bed.Next aft is the master deck, with room for chairs and a table. There are also two additional chest freezers plus the aft crane.Flybridge deck:Stairs lead from the aft main deck up to the pilothouse deck and then up to the vast flybridge. This is a flybridge you would expect to see on a 130' vessel. As you come up the stairs you will first see the large Jacuzzi, perfect for soaking away the aches of a full day of racing, an extra large sun pad area greets you next with room for several people to relax and take a snooze. 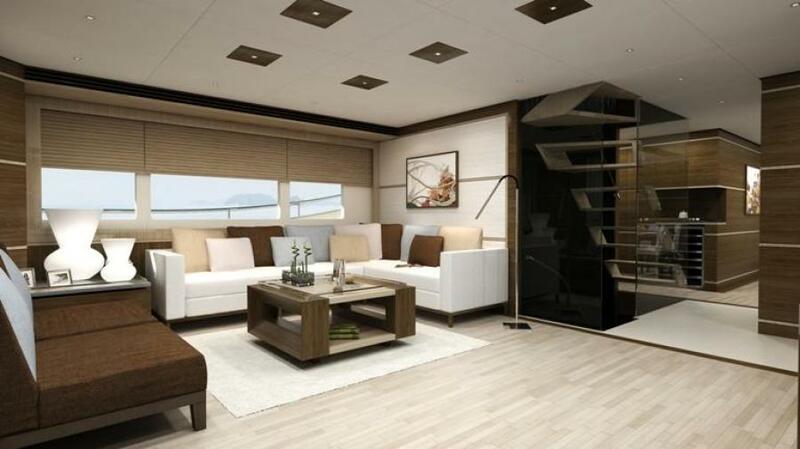 There is storage under the sun pad.Next forward to port, under cover, is an over size seating and dinning area with storage under, to starboard of that is a large full bar with seating for six, drinks fridge, ice maker, sink and storage. Aft of the bar is the BBQ center.Forward up two steps is the raised stadium seating with two 6' plus bench seats to port and starboard and a center helm. Guest can follow the races from this vantage point or the seats are sized to be comfortable day beds to read and relax in the shade.Looking forward from the raised seating you will see the boat deck, capable of carrying 2 x 22' chase boats or a combination of tenders. These large tenders will not only allow you to service the race boats but will keep your guest dry while ferrying them to shore or to water activities.When the tenders are off, this deck becomes another excellent place from which to watch the race action.This is one of several combinations of interior layouts that are available for the AOY BC 103 R.S.EThe D.S.V (Dive/Wreck/Research Support Vessel)Mission profile: to meet the requirements of the people that are dedicated divers and/or researchers and/or wreck hunters who wishto explorer and dive remote locations around the world.Any of the interchangeable layouts will accommodate and support extensive worldwide remote diving.The large lazarrete will accommodate a full dive center including a decompression chamber. 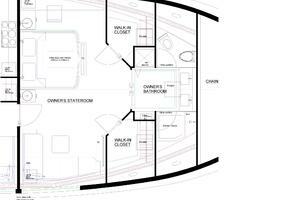 The expansive aft deck is a highly flexible area. The removable rails will allow for easy deployment and retrieval of side sonar, shark cages, floating dive platforms, suction dredges and other equipment. You can carry a huge array of under water toys on deck and/or a 10'x8' container for research or other gear. You also have the option to use this deck to carry a 3rd tender.The 2 standard large tenders can carry divers too hard to reach dive sites or shore to explorer.I would suggest the captains up layout to allow for extra crew to help with dive operations and/or carry guides.The T.C.V (Toy Carrying Vessel) Mission profile; to carry as many and as wide a variety of water and land toys as possible.The highly flexible large aft deck and the huge lazarrete with over size hatches, and large forward boat deck allows the vessel to carry a LOT and a verity of toys. If you want to carry a jeep on deck, no problem, maybe a small fixed keel sailboat, sailing cat, standard or folding, no problem. Need to carry canoes, kayaks, paddle boards, windsurfers, kite boards, hover craft, water slides, Bladefish dive scooter, any type of scooter, motorcycle,again no problem. How about carrying a folding wing air plane? Same answer, not a problem. You have a huge open format to decide what you want to carry, change your mine, not an issue. 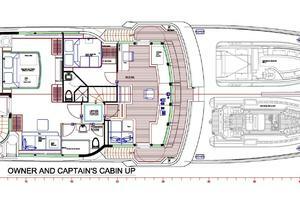 The areas are designed to be completely flexible spaces.What you carry and when you carry it is up to your imagination.Regarding accommodations and crew,it isagain recommended to have the captain's cabin up layout. The more toys you have the more crew you will need to keep them up and to take care of everyone playing on them.The S.S.V (Submarine Support Vessel) Mission profile; carry a submarine to remote locations.We have had a number of clients that are interesting in exploring the world and having a submarine on board. Most of the vessels that can carry a 2 or 3 man submarine are quite large and/or conversions. 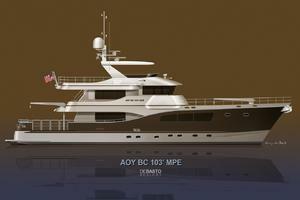 The AOY BC 103 SSV is the most compact size that will accommodate a submarine up to 18,000 pounds.Any of the standard or optional layouts will work on this vessel.All Ocean Yachts has spent a great deal of time speaking with the submarine manufactures and crews that have worked on vessels with submarines and one thing we have noted is that on all of the vessels, deploying and retrieving the submarine is a human intensive procedure. For this reason I have made the standard layout for the S.S.V a captain’s cabin up layout with the option for an additional crew’s cabin in the lazarrete. This will give you up to 7 crew or a combination of crew and submarine pilot or guide.The 18000 pound sub is the max size this vessel can carry and deploy. It requires an aft two point A frame crane system. Smaller subs can use a boom crane.Depending on the intentions of the owner, the vessel can be used for research, with a lab set up in the skylounge area or for film work with a film lab again in the skylounge area. The lazarrete accommodates a full dive center.Please let me know if you can think of another niche explorer need that you would like to accommodate. Air horn: Buell quad pneumatic air horn with auto fog system. Bilge system: Piping to be CuNi.There shall be an AC power system and DC system; the AC system shall be backed up by the fire main system. Fuel oil system: 4 tanks including day tank holding approximately 9160 US gallons (34,800 liters) Alfa Laval MiB 303 fuel cleaning system, two x Racor fuel filters, Mod 75-1000MA for main engines, 2 x Racor fuel filters, Mod 1000 single for generators, Blackmer series molel 414-414A electric transfer pump, one manual pump. WINDSHIELD WIPERS Five (5) electric wipers, one for each of five (5) center windows, Exalto / Vetus 295M pantograph with integral washers, or equal, with stainless steel arms. COMPASS Two (2) Danforth 5" Constellation or similar. Aft deck;The aft deck is 20'x22', it has 2 over sized hatches (10'x5') to the large lazarrete. 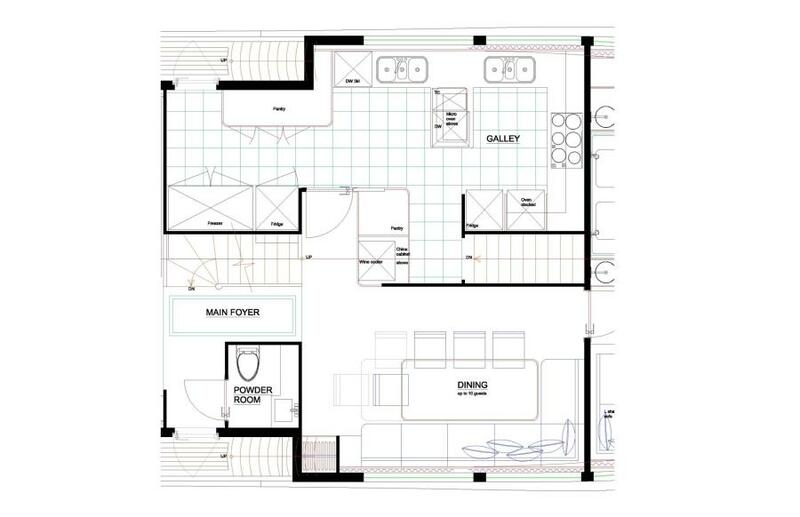 This space is highly flexible and can be arranged to accommodate a wide variety of uses. There are a large number of hard points built into the deck to allow for securing equipment of all types. The deck will fit a 10x 8’ container between the hatches. A sun awing can be deployed over it to create a shaded work or entertainment area. Standard layout comes with removable side rails but there is an option for manually folding bulwarks using the 2 ton aft crane. 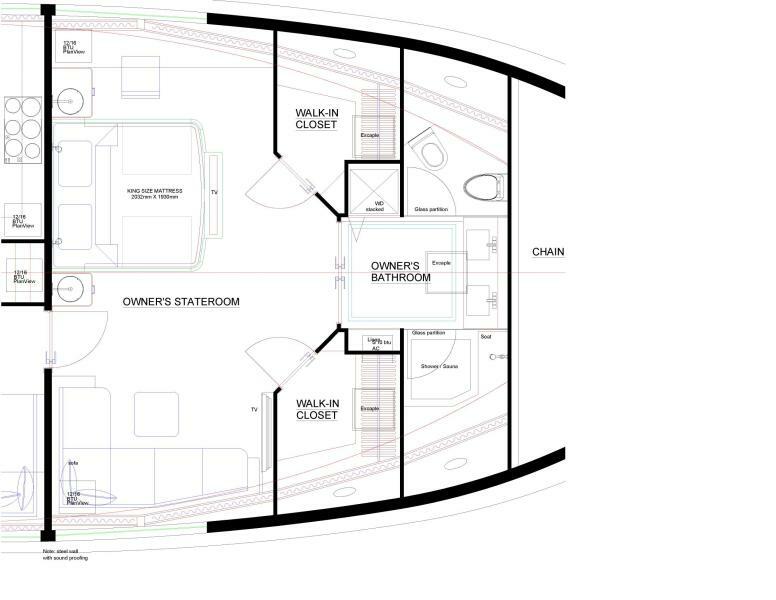 When the bulwarks are folded out 90 degrees it will expand the deck by 6’6” creating a huge 20’ by 28’6” area.There is a full wet bar located forward by the door to the main saloon.The lazarrete is 21’x12’6”, it can be accessed via the deck hatches or at the door from the swim platform.This area is also highly flexible and can accommodate a full dive center, toys, sails or other gear. 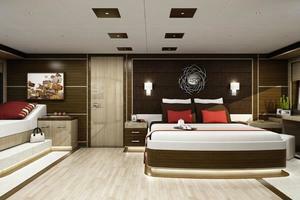 There is a large crew lounge located aft of the crew cabins on the port side. 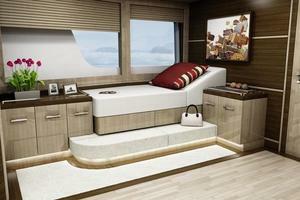 It has a 6’6” settee with lowering table to make a bunk tocarry an extra short term crew or guide. There is storage under it. Across from it is a counter with sink, fridge and microwave above. 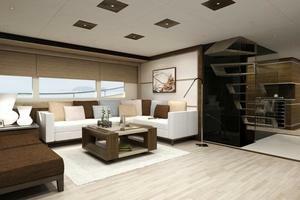 The lounge leads to either stairs to the galley or aft to the full size laundry with direct access to the guest areas. 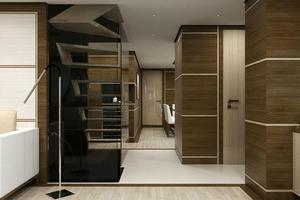 There are two crews quarters forward on the lower deck with ensuite heads with separate showers. The crew cabins can have single over and under berths or a lower double berth.The cabins are accessed from the stairs leading down from the galley.There is an option for an engineer’s cabin in the lazarrete.